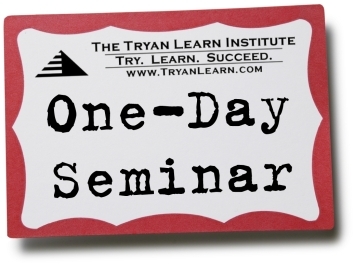 "One-Day Seminar is hilarious! It's clever, well thought out and dead-on...much funnier than most episodes of a half-hour comedy series." humor to skewer a world that takes itself too seriously. And, unlike most seminars that I have been to, it is time well spent." "...I just have to have respect for a man who creates a vision like One-Day Seminar... director Binder kept me in near stitches"
"I can guarantee you will laugh out loud during some of the scenes"
"...if you get a chance to check it out, it's definitely worth a look"
"One-Day Seminar is a promising effort"
"...an all around worthy example of possible potential"
Benson Mountebank is the top-rated seminar speaker at the The Tryan Learn Institute, where the motto is Real Seminars for Real People. This short movie chronicles a day in the life of Benson as he checks into his hotel, gets ready in his room and teaches a one-day seminar on Succeeding as a First Time Manager. As the seminar ensues, we (along with the seminar attendees) bear witness to Benson's inability to put together a coherent thought. Is Benson really that inept or is there actual meaning behind his seemingly worthless advice and pointless activities? The only way to find out is to take a candid peek at a day in the life of Benson Mountebank, professional seminar speaker. Watch One-Day Seminar in its entirety on IMDB Theater!